The case that can be made for transatlantic voyages by medieval Irish monks is a reasonable one. We know that Ireland was the centre for a vigorous culture during the fifth and sixth centuries CE, preserving Christian civilization in Northern Europe after the decline and collapse of the Roman Empire. During this period, Irish monks ventured out into the North Atlantic in pursuit of some kind of spiritual or divine mission. They reached the Hebrides, Orkneys, and Faeroe Islands. The Norse sagas suggest that Irish monks were even in Iceland when the Norse settled there after about 870 CE (though no archaeological evidence has yet confirmed this). Such accomplishments add authenticity to the story of St. Brendan, who was born in Ireland about 489 and founded a monastery at Clonfert, Galway. According to legend, he was in his seventies when he and 17 other monks set out on a westward voyage in a curragh, a wood-framed boat covered in sewn ox-hides. 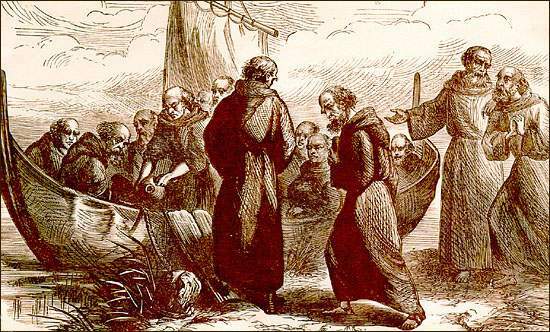 The monks sailed about the North Atlantic for seven years, according to details set down in the Navigatio Sancti Brendani Abbatis in the tenth century. St. Brendan and his Brethren Setting Sail, n.d. Artist unknown. From Rev. Denis O'Donoghue, St. Brendan the Voyager (Dublin: Brown & Nolan, 1893) frontispiece. Eventually, they reached "the Land of Promise of the Saints," which they explored before returning home with fruit and precious stones found there. Had Brendan reached Newfoundland, using the islands of the North Atlantic as stepping-stones? In 1976 and 1977, the adventurer Tim Severin demonstrated that such a voyage was possible by building the Brendan, a replica of a curragh, and sailing it to Newfoundland. If Irish monks did voyage across the Atlantic and back, then their achievement was historically very significant, for Ireland was the target of Viking raids before the end of the eighth century, and it is perhaps through the Irish that the Norsemen learned about other lands further to the west.